They were wild, and they were cantankerous. They were Texas cattle. They were long-legged, long-bodied and long-horned. They began arriving after the Civil War, as Texas cattlemen hoped to recoup lost fortunes. Prices for cattle were higher up north, and they could be shipped east on the Union Pacific cheaper and quicker than from Kansas. For 10 years, from 1875 to 1885, Ogallala, Nebraska reigned as Queen of the Cowtowns. Shrewd and calculating cattlemen from the northern plains met in Ogallala\'s hotels and saloons with the Texas cattle kings to haggle over prices for the longhorns. Gold flowed freely across the tables, liquor across the bar, and occasionally, blood across the floor. This was Ogallala during its 10 years of fame as the point of delivery for the herds of Texas cattle being driven up the Western Trail to stock the northern ranges. 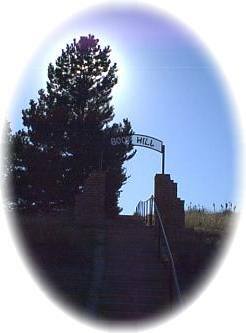 Named for the Oglala band of the Dakota Sioux Indians - oglala meaning \"scatter one\'s own\" - Ogallala was strategically located on the Union Pacific Railroad. As farmers settled eastern Oklahoma and Kansas, they destroyed the famous Chisholm Trail, forcing the herds westward, and the Western, or Texas, Trail through Dodge City, Kansas to Ogallala, Nebraska, was established. From Ogallala, Texas cattle were shipped east of sold to ranchers from Nebraska, Montana, Wyoming, the Dakotas and Colorado. Indian agencies provided an early market for Nebraska beef. As many as 125,000 head of cattle made their way to Ogallala each year. A serious epidemic of Texas fever swept over Nebraska during the summer of 1884, causing heavy losses among the cattle. Thus, Ogallala\'s corner as a cowtown virtually ended in 1884. Yet the cattle industry emerged again, based on the firmed foundations of blooded stock and fenced land. It was for its heyday as the end of the Texas Trail Drives that Ogallala was designated by the Nebraska State Historical Society as Nebraska\'s \"Cowboy Capital.\"
Today, Ogallala is still Nebraska\'s Cowboy Capital. Ogallala Livestock Auction Company has sold more cattle during a year\'s time than any other sale barn in the state. Thousands of cattle, worth millions of dollars, go through the Ogallala sale ring. A century has passed, yet cattle remain king. East on Prospector Road and east of TravelCenters of America.